With a strong enough magnet, you can lift a car. Magnets are different to other objects. In magnets, the electrons in atoms at one end all spin in one direction, and those in atoms at the other end all spin the opposite way. This creates a force of energy around the magnet, called a magnetic field. You can turn a piece of iron into a magnet. What causes a magnetic field? In most objects, all the atoms inside are balanced - this means half of their electrons spin one way, and half spin the other way. These atoms are spaced randomly in the object. But magnets are different creatures! Inside a magnet, the atoms at one end contain electrons that all spin in one direction - meanwhile the atoms at the other end contain electrons that all spin in the opposite direction. Rather than spinning in a balanced way, the electrons all line up. This is what creates the magnetic field around the magnet. What are the North and South Pole of a magnet? The North (N) and South (S) Pole of a magnet are the names given to each end of the magnet. The force of the magnetic field flows from its North Pole to its South Pole. Try it yourself: Hold two magnets close to each other. You’ll find that if you try to push the two North Poles or the two South Poles together, they resist and repel each other. But if you put the North Pole near the South Pole, they attract each other and pull together. A magnetic field pulls and pushes electrons in certain objects closer to them, making them move. Metals like copper have electrons that are easily moved from their orbits. 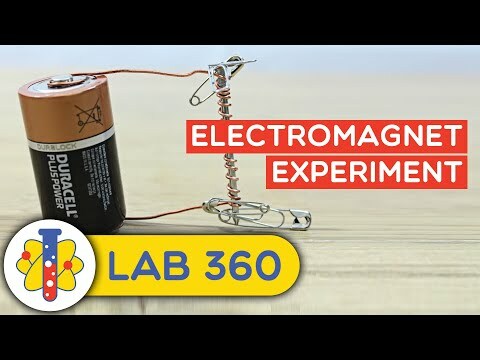 If you move a magnet quickly through a coil of copper wire, the electrons will move - this produces electricity. Magnetic fields are areas where an object exerts a magnetic influence (think of it like an invisible field of magnetism). The North Pole and South Pole are the two ends of a magnet. The North and South Poles of two magnets attract each other, but two Norths or two Souths will repel each other. If you cut a bar magnet in half, you get two new smaller magnets which each have their own North and South Pole. A compass is essentially a magnet that is free to move. The arrangement of atoms and the direction of their spinning electrons is different in magnets to other objects. As half a magnet’s atoms have electrons spinning in one direction, and the other half have electrons spinning in the other direction, a magnetic field is created around the magnet.